In just a little over a year, Labrabbit Optics has become one of Chicago’s top eyewear stores. Labrabbit’s owner, Coyote DeGroot, talks to us about rapid success, eyewear style, and parental ultimatums. Coyote DeGroot, owner of Labrabbit Optics. Photo by Christine Stulik. It sounds weird to call a boutique eyewear store “anti-establishment,” but considering what constitutes established eyewear stores — a punny name, posters of smug, spectacle-sporting models, and designer glasses made by popular labels — Labrabbit Optics is undoubtedly the antithesis of just about any place that pedals frames. During a visit to Labrabbit’s Wicker Park based studio-apartment-sized store in late September, we saw the following things: a video art installation, a ceiling covered in tin-foil pans (also art), and two large posters of Signorney Weaver from the movie Aliens. This last item was not part of any art installation. Aliens just happens to be the favorite movie of Labrabbit Optics owner Coyote DeGroot.As interesting as Labrabbit’s decor is, it does not detract from what the store sells: eyewear, specifically eyewear no one’s heard of or no one has seen in decades. On the store’s shelves you might find Ben Franklin-esque wire-framed specs in one spot, and on another, post-modern frames worn by the likes of Kanye West. 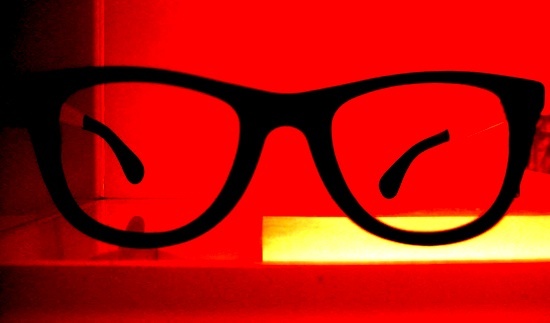 It’s like an ultra-hip eyewear Tumblr came to life in storefront on Ashland Avenue. “It’s a continuous treasure hunt on my end,” explains DeGroot about his process for finding the eyewear he sells. “Not always easy.” The glasses he sells fall into two categories: new eyewear and deadstock eyewear. The former is pretty self-explanatory, even if the labels he carries aren’t common. 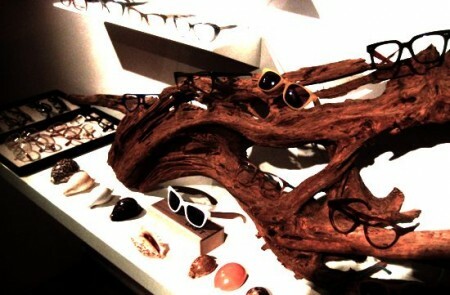 The latter, deadstock eyewear, consists of frames that have been out of production for years or decades. These aren’t used glasses, just frames that for whatever reason, were never sold. Perhaps they were just a little ahead of their time.As good as DeGroot, 30, is at plucking unique frames from obscurity, his gift wasn’t always so apparent. He admits to getting kicked out of college years ago, and then moving back home with his “ less-than-elated parents” parents. At that point, he entered the eyewear business out of necessity.“My mom told me to get a job in two weeks or she was going to kick me out of the house. I’ve always been attracted to medical and technical trades, so I randomly got a job working in an optical lab.”The optical lab work gave DeGroot the knowledge to become a certified optician, which might not be as crucial to his business as his ability to locate glasses with both a cool and quirk factor, but it allows him to run his shop almost autonomously. There’s no outsourcing lenses to be cut or re-sized. A glasses display at Labrabbit Optics. But perhaps what his customers appreciate more than DeGrott’s inventory of glasses, or ability to cut frames onsite, is the attention they receive from him inside his store. DeGroot doesn’t have a massive staff. On most days its just him in his store, working one-on-one with his customers and making sure they find the right set of frames. And he never stops being attentive. When we visited with during Labrabbit’s one-year anniversary party in late September, he was asking customers in attendance how their glasses have been holding up, and even performing maintenance on a pair of lenses. 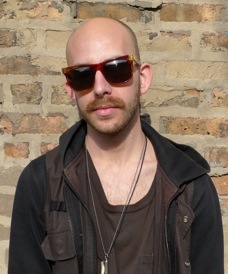 Man Up Chicago: When did you start wearing glasses? What was the first pair that you can remember wearing? Coyote DeGroot: Around the age of 8 or 9. It was a large metal navigator frame with a double bridge, suspiciously similar to what I’m now wearing in my 30’s. My Dad also wears the same shape, so it must be genetic. MUCh: What is the biggest thing you’ve learned about yourself or about business after owning a company for a year? CD: Owning a business isn’t a job, it’s a 24-7 lifestyle. People have a good chuckle when they hear that I open the shop at 1:00 PM everyday, but they don’t realize that I’m usually responding to emails, attending meetings, or cutting lenses for hours before I even unlock the front door. And I’m usually there for an hour or two after I close. I love it, but if you want it to succeed you need to invest yourself completely, making it a commitment on par with having a baby. But at least with a kid you can kick him out when he’s 18. MUCh: Do you have any plans for expansion? CD:Yes, the five-year plan includes opening a second location on the East coast.MUCh: What’s the biggest mistake that men make when picking out a pair of glasses? CD: Most of the guys that come into the shop do a pretty good job of picking stuff out that melds well with their personal style. That being said, I always nudge people just slightly outside of their comfort zone. Looking cool is an investment, one that takes time and and money. It’s not an overnight transformation, so you have to approach it step by step. A man should never settle for the status quo. MUCh: I know head shape and size can determine what type of eyewear looks best on someone, but do you ever try to get a read on the person’s personality to make sure it matches what they want? CD: Personality has more bearing on eyewear selection than face shape. I’m pretty good at reading people at this point, so a good conversation is going to tell me a lot more than the circumference of someone’s skull. Though I’m present to share my expertise and opinions, I’m anything but a salesman. A good product sells itself, which is why I have such a broad spectrum of frame styles at the shop. That being said, as a Certified Optician with an on-site lab in his shop, I always make sure that the frame will be a good pairing for the customer’s prescription lenses. MUCh: For the guy who wants to wear something very rare and bold, what three sets of glasses from your store do you recommend? CD: Tart Arnels are great for anyone looking for a rock-solid vintage frame with a classic shape. The seven-barrel hinges are beyond burly. For something a little more contemporary and colorful, RvS By V continuously kills it with their new designs. 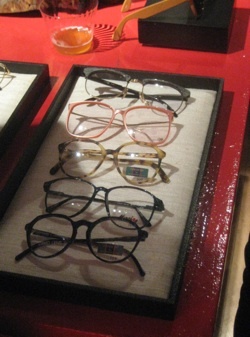 Their frames have a really cool matte finish, and their unusual choice of shapes is unparalleled. And everyone needs a good pair of sunglasses, which is where Illesteva comes in: The Leonard and Frieda shapes look awesome on both men and women, and come in a zillion colors to boot.